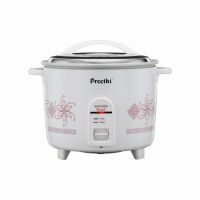 This preethi rice cooker has a power consumption cooking 750 watt. It ensures consistent cooking performance leading to excellent quality of food preserving all the essential nutrients making your food tasty and healthy. 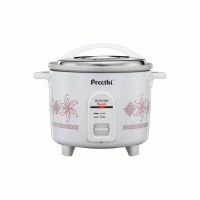 This rice cooker comes with double protection thermal fuse and Micro switch are interlinked to protect the rice cooker from power fluctuation. It comes with auto warmers Keeps the food warm even after four hours of cooking. To Recieve updates and possible rewards for Preethi Rangoli 2.2 L please sign in. To Recieve updates and possible rewards for Electric Rice Cooker please sign in.